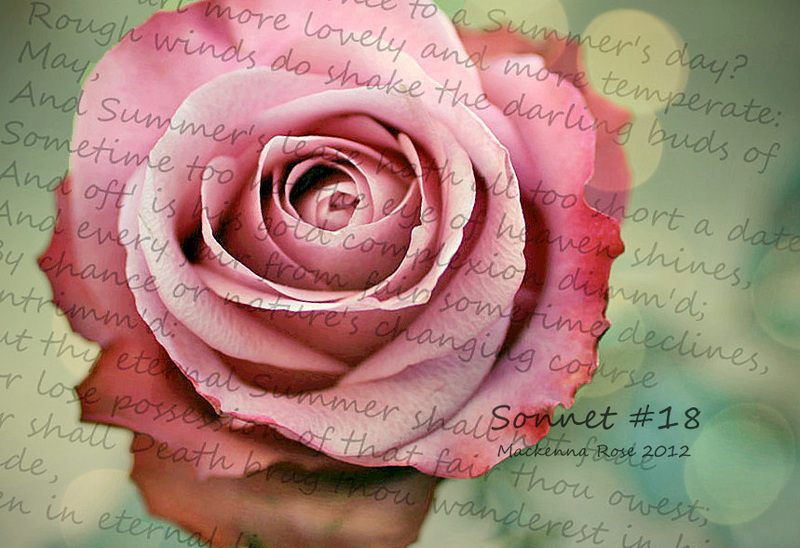 Considered by some to be the epitome of Romantic Poetry, Sonnet 18 could be the most popular of the 154 Sonnets. A number of exegeses have revealed double meanings strewn just about everywhere thereby making it irrevocably one of the most evocative works in Romantic Literature. A personal favourite and interestingly highly regarded by those wanting to try their hand at Sonnet writing. The Sonnet with a bit of a paradox as the famous question " Shall I compare thee to a summer's day" seems to beg for an answer in the negative and yet the next 11 lines are spent doing just that. It would then seem like this is in fact a rhetorical question seeing as there was gross flattery in the previous Sonnets and as a result there could would very little justified doubt that the Fair Youth is to be compared to a 'summer's day'. At this point it is a tad necessary to remember that a summer's day is often considered to be the paragon of the seasonal calendar. There is no better weather, scenery or atmosphere to enjoy than that of a summer's day. Though seemingly impossible, the Fair Youth is out-rightly proclaimed as being "more lovely," immediately leaving to the imagination the true elegance of the Fair Youth. In order to adequately accentuate the Youth's superiority in 'looks'( or even in general), Shakespeare goes on to point out the most distinguished flaws of a summer day. Note the shift from the monotony of describing the Youth to describing what the Youth isn't. The theme of time's passing comes into play in the third line as all too soon, "rough winds" have their way with "the darling buds of May" a fate to be avoided by the Youth as expressed by the final couplet. Summer's fatal metamorphosis is further augmented through the use of the word "darling" whose connotations point to a girl's progression to womanhood. A step though celebrated and inevitable is on the face of it aging and a depreciation of beauty. Juxtaposition of Summer's undesirable extremes, " ...too hot the eye of heaven shines" and "... often is his gold complexion dimm'd" serves to eke out a sense of abhorrence towards Summer whilst also casting the image of perfection regarding the Fair Youth. Facets of Summer that are usually acceptable are made to look like some sort of disaster. Line 8 reflects a rather interesting change in philosophy from the Procreation Sonnets as the persona seems to imply that the passage of time might just be a matter of 'chance'; the concept of inevitability has been swept away since there is no desire to convince the Fair Youth to have children anymore. This does leave the persona looking a tad deceitful. Unlike Summer, the Youth's desirable qualities will not wane as who-so-ever reads this Sonnet would automatically would know just how beautiful the Fair Youth was. In this, Shakespeare makes a freakishly accurate prediction thereby also highlighting the power of writing. His Sonnets have become the offspring and have faired much better than any other form of preserving a legacy would have. Quite evidently good writing is timeless.